The Maurice C. Hull "stove, hardware and furnishing store" at 311 3rd Ave. appeared in Doggett's New York City Directory in 1849-50. The date 1849 was cited years later by Hull, Grippen & Co. as the date of their founding. But it was not until 1867 that Theodore E. Grippen (1831-1898) joined Maurice C. Hull (ca. 1832-1884/85) to form Hull, Grippen & Co. as a partnership. During the intervening years 1849 to 1867 M. C. Hull at 311 3rd Ave. and then later at 288 Third Ave. dealt primarily in stoves and cooking ranges. It was also during this period that Maurice C. Hull secured several patents relating to fireplace grates, cooking ranges and heating stoves. This ad for M. C. Hull appeared in Trow's New York City Directory, 1859. This ad for Hull, Grippen appeared in Lain's Brooklyn Directory, 1868. At that time their address was 288-290 3rd Ave. between 23rd and 24th streets, and the company name was written as Hull & Grippen. A year later this two-page spread gave the name as Hull, Grippen & Co. Hull's patent is mentioned. In 1871 the address had become 310 & 312 3rd Ave. It was approximately 1870 when Hull, Grippen & Co. moved to 310 3rd Ave. The address 306-314 3rd Ave. (near 23rd St.) became their address for the next 60 years or so. In the 1870s the business dealt in furnaces, ranges, plumbing, hardware and house furnishing goods. In the 20th century their business was directed more at builders' hardware and contractors supplies. This ad appeared in the New York Times, 18 Sep. 1901, p. 26. The names at the top are Belden J. Rogers and Walter L. Treat. Belden J. Rogers (1845-1909) joined Hull, Grippen & Co. in the late 1860s. He became head of the company in the late 1880s. His obituary notice in the New York Times, 7 Aug. 1909, read, "The funeral of Belden J. Rogers will take place at the Marble Collegiate Church, Fifth Avenue and Twenty-ninth Street, at 1:30 this afternoon. He was a captain in the Old Guard, and four of the pallbearers, H. H. Brockway of the Ashland House, S. W. Seybell, William H. Seaitch, and E. Barnes, are also members of that organization. The burial will be at Woodlawn in the family vault. Mr. Rogers died suddenly at the Grand Union Hotel, Sarasota, on Wednesday night. He resided at 43 East Twenty-seventh Street. Besides being in the Old Guard he was a civil war veteran, a member of the New York Athletic Club and the Larchmont Yacht Club, and a Free Mason. He was a Director of the New Netherland Bank and the head of Hull, Grippen & Co., 308 Third Avenue." Walter Leverett Treat (1862-1918) received only a brief notice in the Times, 2 May 1918, reading, "Walter L. Treat, President and Treasurer of Hull, Grippen & Co., builders', hardware, and contractors' supplies, 306 Third Avenue, is dead at his home, 532 Lefferts Avenue, Richmond Hill. He was born at Orange, N. Y., fifty-five years ago. One of his children, Sanford Treat, is a Lieutenant in the national army, stationed at Camp Dix." There appears to be an error here: the Orange of Walter Treat's origins was a farming community in Connecticut, not New York. He was recorded in the U. S. Census of 1880 living in Orange, Conn., with his father, B. Leverett Treat. Walter Treat received an extensive biography in American Biography, Vol. VII, 1920. This work is available as a Google Book. The text is sufficiently mutilated in the Google version to be hard to read in places, but it seems to say that Treat graduated from Yale Business College in 1882, and that his earliest business experience was in the hardware business with a maternal uncle at Danbury, Conn. In 1886 he moved to New York, where he "became associated with another maternal uncle, Mr. Belden Rogers, who was engaged in the hardware business also. Three years later Mr. Rogers died and the younger man, who inherited the larger proportion of the interest in the business, incorporated the same under the style of Hull, Grippen & Company. In this corporation he controlled the majority of the stock, and was given the offices of president and treasurer. The incorporation took place in 1889, just forty years after the establishment of the business, and the industry, farsightedness and executive ability of Mr. Treat rapidly built up the enterprise until it had reached great proportions, and it eventually became one of the largest of its kind in Greater New York." This account contain several errors, placing events twenty years before their time. Belden Rogers died in 1909, not 1889. And the business was incorporated in 1909, not 1889. This ad dates from 1911 and appeared in The Post-Graduate published by the New York Post-Graduate Medical School and Hospital, 2nd Ave. at 20th St. This ad appeared in the New York Herald, 27 March 1922, p. 5. Hull, Grippen were the subject of a brief notice in Autocar Messenger, June 1931, available as a Google Book. The company's delivery truck is illustrated. However, Hull, Grippen appear to have gone out of business around this time. Their final listing in the Manhattan telephone directory was in 1930. One of the company officers, Nicholas I. Herrick (1870-? ), seems to have continued the business at 310 3rd Ave. until around 1938. 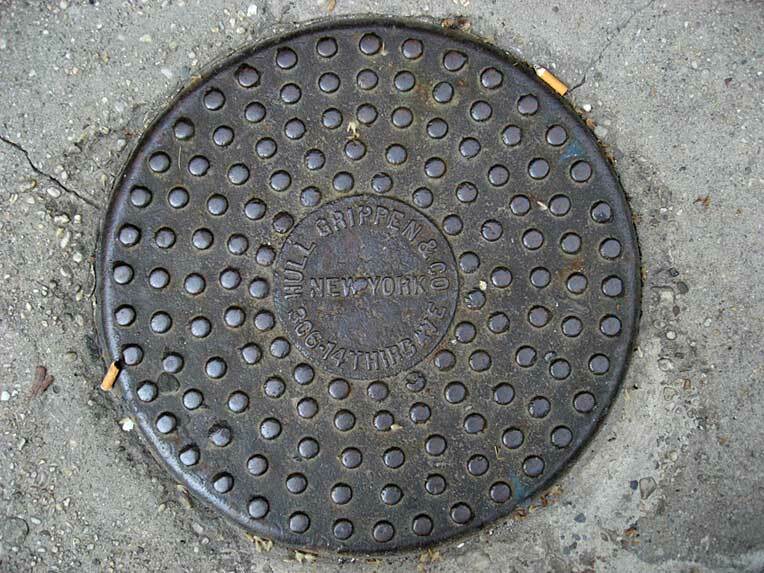 Other very similar coat chute covers inscribed Hull Grippen can be found at 10 Perry St. and 38-40 E. 76th St.